Description: Starts out fairly open with first hole going around pine trees. 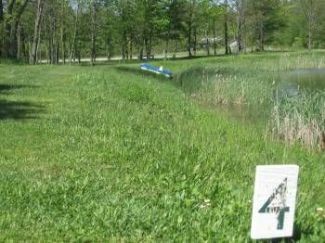 8 holes play around a pond and there are 5 wooded holes. If you have lost any discs, be sure to post them here. We have recovered many discs that have been lost in the pond. In addition to the 18 hole layout, there is a (short) 9 hole layout marked with red and white tee signs and red and white signs underneath the corresponding baskets. Local Directions: I-69; exit 264 west 5 miles to a left (south) on Pennsylvania St. (light), 0.25 mile to the course on left behind Eastgate Community Church.